Most facelifts occur when one is a little older; however, at four years old it was time for us to take the big plunge. Our facelift has started with a new website and blog. Our updated website launched today. 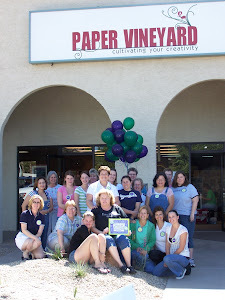 It is the same web address www.papervineyard.com but a new look. From the new website there is a blogger link (small orange icon in upper right hand corner) that takes you to the new blog which does have a new address blog.papervineyard.com If you have us bookmarked you will need to update it to our new blog address. Keep following us as more changes will happen within the next couple of weeks as we open Paper Vineyard launches the new Grapevine Designs store on-line. Competitor Coupon Day is always the first and third Friday of every month. February 2012 dates are 2/03 & 2/17. Bring in a Michael's, JoAnn or Hobby Lobby VALID coupon for special savings. Limit one coupon per customer per day. We are open 10am - 7pm on Fridays! Total Pageviews - Thanks for checking us out!! !